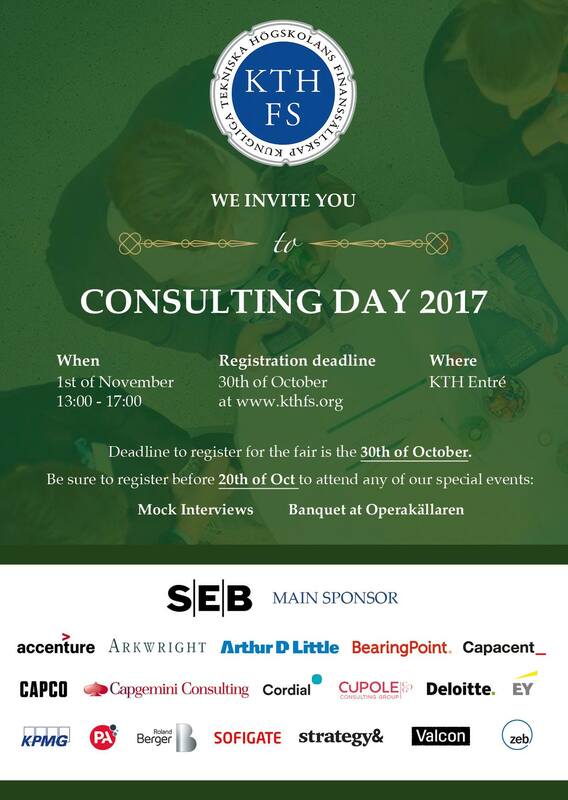 Consulting Day is KTH Finance Society’s annual consulting oriented expo and the year’s most coveted event on KTH Royal Institute of Technology. The event will include the unique opportunity to network with some of the most attractive employers in the consulting services industry. In addition, during the one day event, several inspiring events by high profile business professionals will take place. Consulting Day will conclude with an exclusive banquet in central Stockholm. The expo starts at 13:00 and food and drinks will be served throughout the day. During the day several interviews and company presentations will be held. The exhibition ends at 17:00. Consulting Day concludes with an exclusive banquet at Operakällaren. Representatives from the companies and selected students will have the opportunity to network and socialize in a more informal setting. The banquet will feature a luxurious three course dinner and entertainment. Please be advised that the seats for the banquet are limited. Interested in a career that challenges you? In a firm that invests in your professional development? In following a career path that provides plenty of choice? In being given the opportunity to excel? Then Consulting at Deloitte could be the perfect fit for you! Fins out yourself by meeting us during an mock interview! We are constantly looking for exceptional students, characterized by a passion to excel, open-mindedness and integrity. Apply for our mock interviews at Consulting Day 2017. Dela dina tankar kring konsultyrket och diskutera om du och PA kan vara en framtida match under denna möjlighet till kontaktsamtal med oss! BearingPoint is a leading management and IT consulting firm – a global firm with a small firm feel – a characteristic that many of our people find helps us stand out. We would like to get to know you and to tell you more about how BearingPoint can provide you with the perfect launch pad as you start your career. Do you want to join us in advising leading brands on how to enhance customer experience and disrupt business models in the digital economy? Do not miss the opportunity for a mock interview with Capgemini Consulting – Apply now! Do you possess a passion to grow and develop your career within finance and consulting? The best career happens in a place where you really fit. Come and meet us for mock interviews - apply with a CV in English. Do you want to find out what management consulting is like and are you interested in finance? Ensure to apply for our mock interviews at Consulting Day 2017. Join our team of Business technology consultants solving tomorrow's problems today. As a leading Business Technology consultancy firm in Northern Europe, Sofigate provides advisory and consulting services within three areas 1) Strategic Transformations, 2) Management power and 3) Technology solutions. Kom och träffa oss på Cordial –the Business Transformation Company. En rådgivningsfirma med stort hjärta och höga ambitioner. Lär dig mer om vad vi gör och upptäck möjligheterna att bli en del av vårt team. Improve your interview skills with your potential future employer. Meet Arkwright for mock interviews! We are the HOW consultancy and we are here to meet future colleagues. Experience Valcon through an exclusive mock interview!